This is a brand new Tecla publication, December 2013. These six duos for two guitars by Ferandiere are full of life, originality and humor, and offer much to both guitarists. They come from a manuscript now in Madrid and they date from about the year 1800 when Ferandiere lived in Madrid. They have not previously been published in a modern edition as far as Brian Jeffery knows, and are presented here in the form of a modern score. You can hear Duo 3 and Duo 4 from these Seis Dúos, played from this edition by the Panormo Duo, Wendy Jackson and Christopher Susans. First published by Tecla Editions in 2013. 32 pages with a detachable insert of 28 pages for the use of Guitar 2. Large music size 24 x 31 cm. A handsome new edition on high quality paper, paperbound. 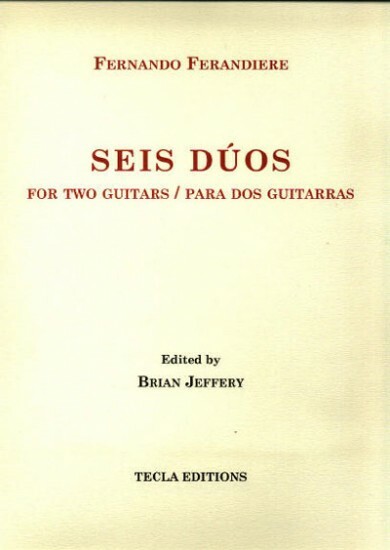 The edition consists of a score of both parts for the use of Guitar 1, together with a detachable second copy of the score for the use of Guitar 2. This edition is published by Tecla Editions simultaneously with a new facsimile edition of Ferandiere's book Arte de tocar la guitarra espanola (Madrid, 1799), in which a new forty-page introduction brings our knowledge about this interesting writer and composer up to date and adds some information not otherwise available.